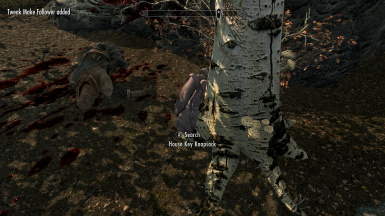 Please: Don't forget Key is in a knapsack next to the tree by the dead body. Use the shovel inside home to bury the mage. 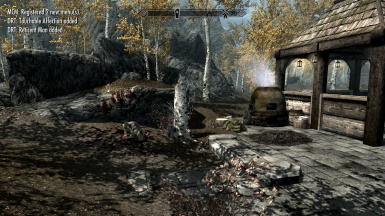 Compatible with Verdant grass, Automatic Item Storage, and Hearthfire multiple adoptions. If a follower does not have a sleep package, you can still use "Amazing Follower" to order them to sleep in a bed. Please post pictures love to see them. 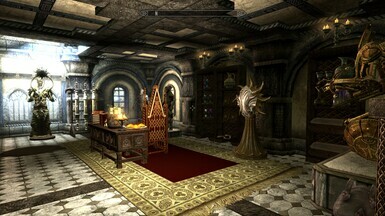 The merchant gold is set to 3750.00. 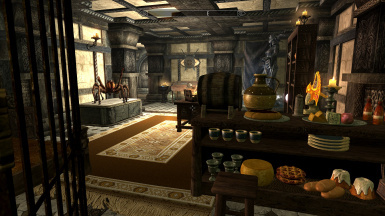 Skyrim has a bug that if you have a mod allowing the vendor to have more than 30,000 gold, the vendor will not buy anymore of your stuff. When adopting more than two kids, there is a possibility that some kids will never go to sleep, because they searched for a bed and found the wrong bed first, and they stop search for a new bed. maybe one of the reasons the designers made it only two kids for adoption. I have changed the beds so that each has their own ID. There are plenty of Xmarkers for kids. Hopefully, the kids will notice there are multiple beds and choose one that was not assigned. I must say... 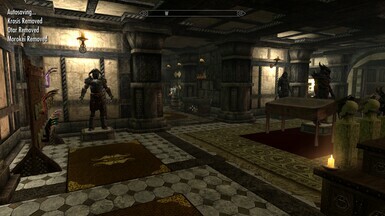 This is the best house mod I've ever tried for Skyrim. I really love it! 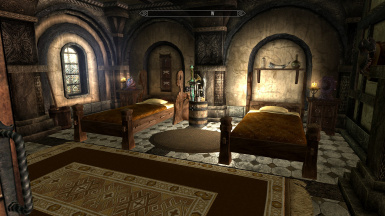 I only wish that there were two extra beds for children... I'll have to find an other place to live if I want the full amount of six... And that's really a shame. Also... The kids never use their beds...? I DID make sure that the rooms were for children and not followers. 1. 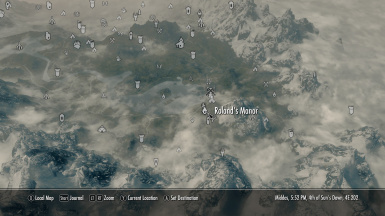 Are you using this mod? "Hearthfire multiple adoptions - Now with custom home support for kids and spouse"
2. 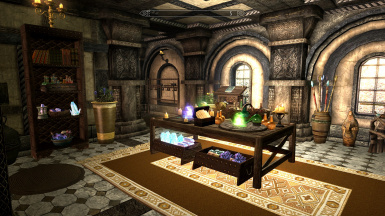 Did you use the Bless this home spell? 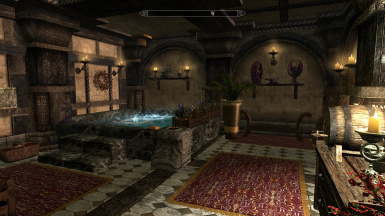 I used the home designer guide from that mod to make this house mod compatible. From your post the kids are in the home but don't sleep in their bed. Where do they sleep? 3. Are the Children in-game children or custom children? 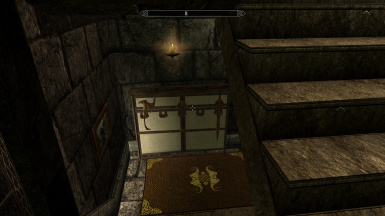 All homes that are compatible with "Hearthfire multiple adoptions" use their guide. The beds are assigned to the Children. 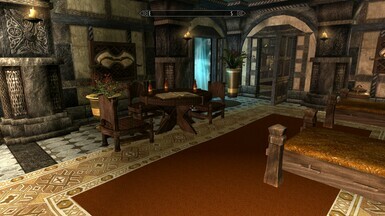 If you used the bless this home spell it would have told you how many beds were assigned. 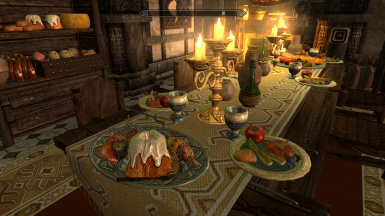 The in-game child's behavior is dictated by the in-game quest or Hearthfire Multiple adoption, and they are given packages by the game not the home. Custom Children have to be designed with the necessary packages to work with Hearthfire multiple adoptions. 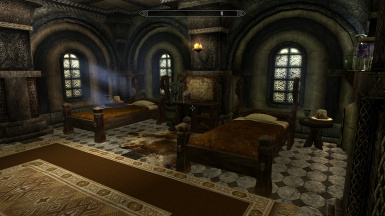 So I will look and examine again, but I'm don't think the beds were accidently changed. 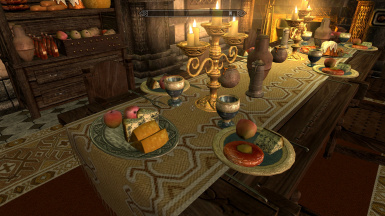 If you used the bless this home spell it would have stated the number of beds. The home can't control the behavior of the children. The children are controlled by the "hearthfire adoption quest" and the designer of the custom children. Checked and all children markers were in the home. Beds and chest were assigned properly. Bless this home stated four beds for kids. 1. 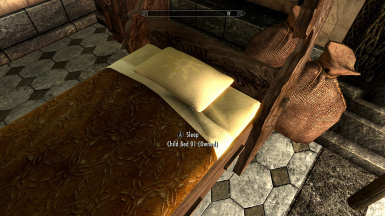 If you have custom children not in-game, ask the designer about their sleep packages and if they work with Hearthfire Multiple Adoption mod. 2. Secondly, post the issue with Hearthfire Multiple adoption. Make sure you followed their instructions. Thank you for such a quick answer! What happens is: The kids stand beside each bed... They just stand there instead of getting in them to sleep. They don't ever sleep. It's as if the beds are too big for them? 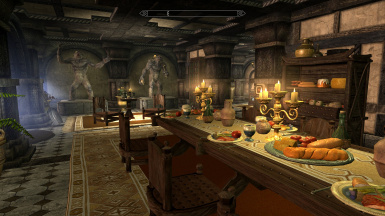 I did use "Bless This Home" before I moved anyone in. 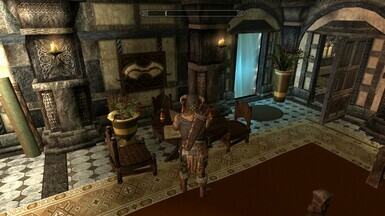 I do have "Hearthfire multiple adoptions - Now with custom home support for kids and spouse" installed as well. The children are original but I use "RS Children Overhaul" which just changes their appearance. I will check things out. Thank you very much for your quick response and assistance. The beds are children's beds, and they are labeled per the guide. Child option should state owned. 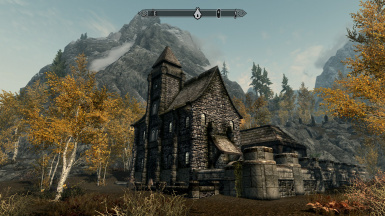 There are two mod that can add kids Hearthfire multiple adoptions and Custom Family Home. Custom Family Home doesn't have a required size bed. 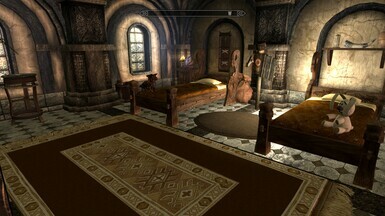 The beds are the standard in-game children's beds. If the bed doesn't state owned, then you clicked the companion bed option. Also the adoption is a quest that can be broken. 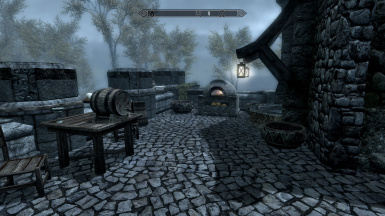 Check with the Hearthfire adoption mod designer about the quest bugs. If beds have to be smaller I will make them smaller. Another update coming up for beds soon. 1/20/2019 I went ahead and uploaded a new version with children beds that I reduced the size. 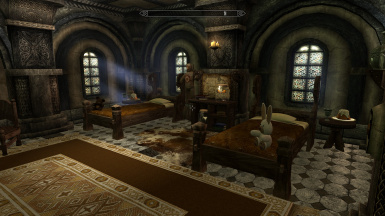 If you are correct the in-game model children beds are too big for some kids. I agree with you. If they find anything, I would love to help :). Need to fix typo on spell. 2.6 version will fix typo. 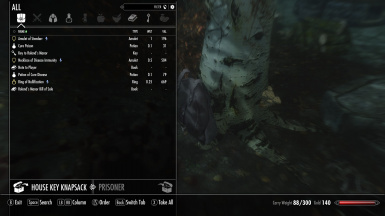 How do I toggle off the clothes coming off my follower? 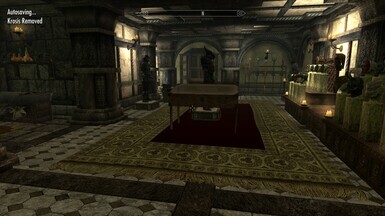 When you enter the Master Bedroom there is a soul gem with a magical effect on. Click on the soul gem and the magical effect will turn off. 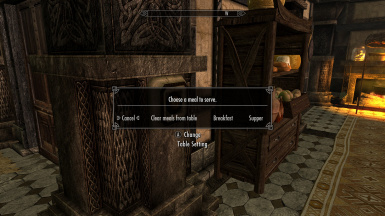 This will toggle armor remover from the bed. This doesn't affect the pool. There is no toggle for the pool. NPC will remove armor in the pool. Glad to help. 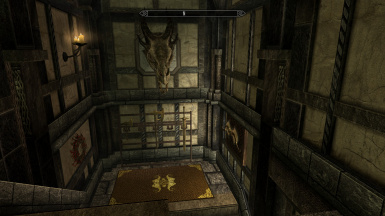 Walk into master bedroom soul gem on night stand. To use Cloud StorageMaster and Five Dependent Homes , remove older versions, start a new game, download the Cloud Master first, then the dependent homes you are interested in. Please note: Each home will have about 20 Mbits total custom assets in its cell, some of it coming from the Master cloud storage. I’m running all five easily but older heavily loaded machines may have issues. Added oven baking crafting outside by fountain. 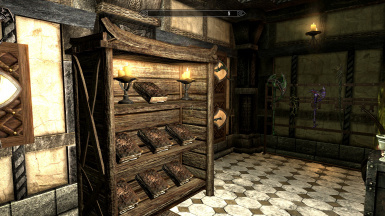 Changed Link chest from the word search storage to player's safe storage for new players. Post pictures love to see them. 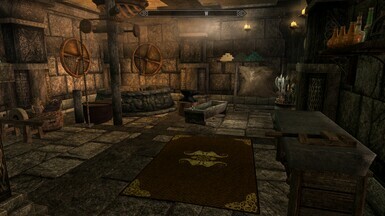 This way the overall mesh changes from other modders will be seen on the rugs in this house. 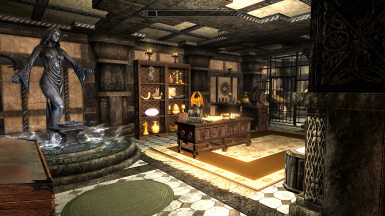 love this home but i do have a small issue the armor removal makes sense enough for bathing and sleep however my merchant runs the shop naked too , any fix for this? The trigger boxes should be over the bed and pool area. 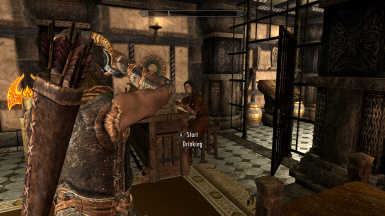 My merchant is only naked in bed. I will check it again. Checked it several times now. 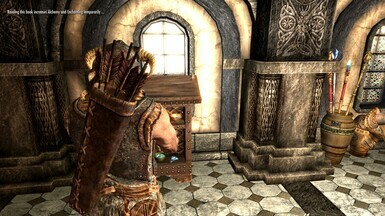 When the merchant enters the trigger box by the bed the merchant's armor is removed, as it was designed to do. While she is away from the bed and by the desk her armor is on. If you want the trigger box removed, she will sleep with her armor. 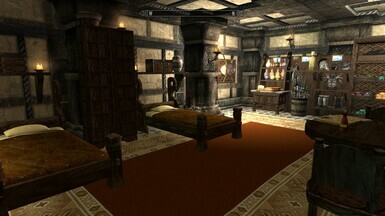 All the beds have a trigger box around them, and when NPCs get close to the bed the trigger removes their armor. If you don't want this, you can remove the trigger boxes from the beds through the creation kit. 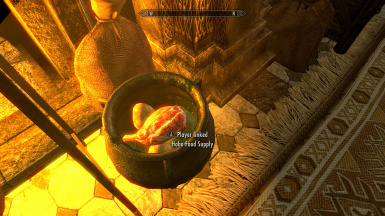 However, the NPCs will sleep in their armor. 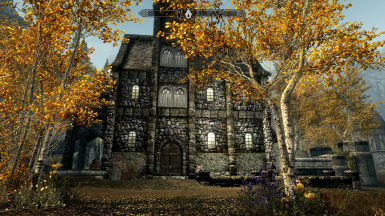 The house is by the lake near Riften. Look at the map page 2 of photos.